I wove some cloth! This shouldn’t be so remarkable, I suppose, but I’ve been really unproductive in the fiber art realm lately so it’s big news. Ultimately I plan to use this cloth to make a new batch of books with purple covers. I had hoped to have a few made in time for the upcoming “Purple Show” at the Shelburne Arts Co-op, but alas they will not be ready in time. I may get them finished before the end of the show…. The show hangs this Tuesday March 31st, and is up until Monday April 27. Here are the weaverly details about this project: The warp is 20/2 cotton, from the discontinued UKI line. The color is called Malay Purple. There are 598 ends in the warp. The sett is 30 ends per inch. The width in the reed is 20 inches. My draw-in (how much the edges pulled in as I wove) was about 6% and the shrinkage in the width was about 4%. Shrinkage in length was about 6%. I washed it by hand in hot water and hung to dry. 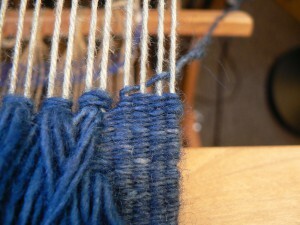 This post is the latest installment in a longer saga about weaving bookmarks with naturally dyed 40/2 linen. The saga spans many months, if not years. I have posted about these bookmarks in the past. You can read my most recent post about it here. Or you can just catch up on the back story in this post! Rya is a Swedish technique for making long-pile rugs or wall-hangings. Historically, as I understand it, these textiles were used as bed-covers. The pile side faced your body in bed, and the “back” side faced up. I am weaving this one to be a wall-hanging. After about two years of planning a series of naturally dyed rya wall-hangings in my mind, I am finally weaving one! I am very excited about it. There are many steps involved. First, I dyed pounds and pounds of woolen yarn. You can read about the process in earlier posts: black walnut, Lady’s bedstraw, Queen Anne’s Lace and woad, and orange cosmos. This project features Queen Anne’s Lace and woad.